The deserts of Arizona are known by many as vast expanses of arid land, jagged mountains, nocturnal animals and cacti as far as the day is long. While that may be true, there’s a perfect window when the weather isn’t too hot nor too cold, the days are getting longer, and swaths of wildflowers come into bloom. 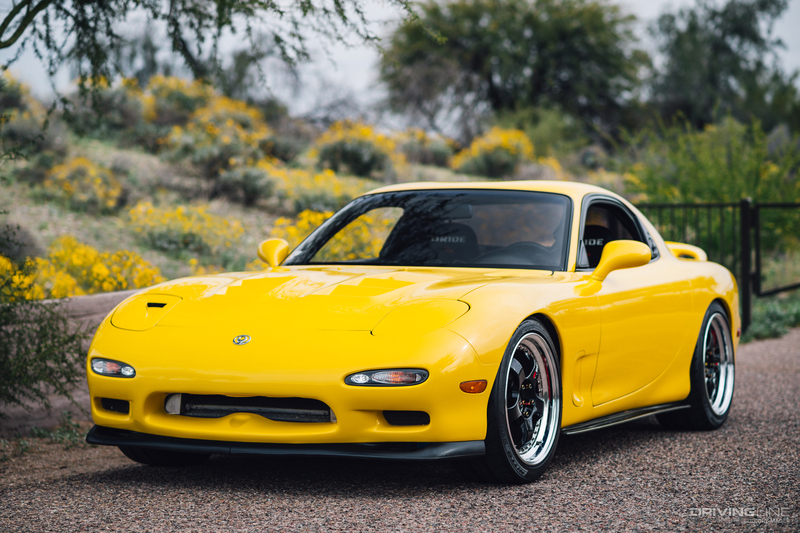 It was during this time we caught up with Tim Eull to take a closer look at his wildflower-esque Competition Yellow Mica ‘93 RX-7 R1. Before diving in, a bit of context is in order. 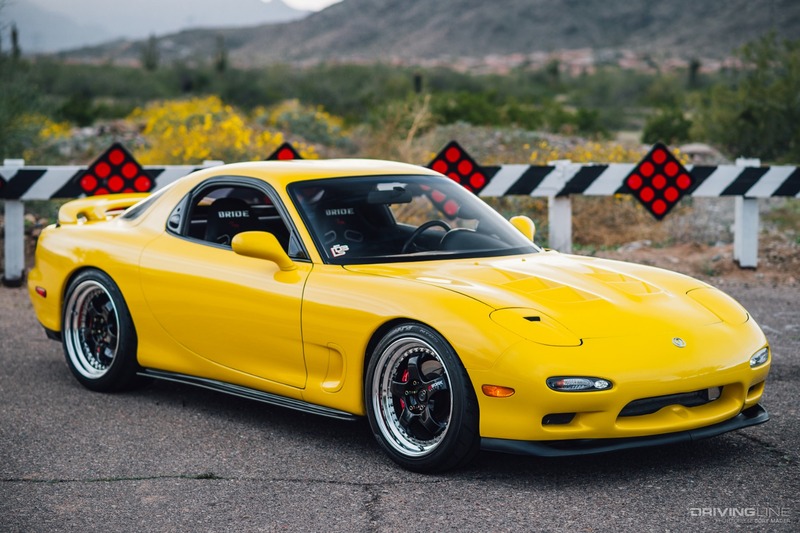 In 1992, the FD RX-7 was released in the United States. 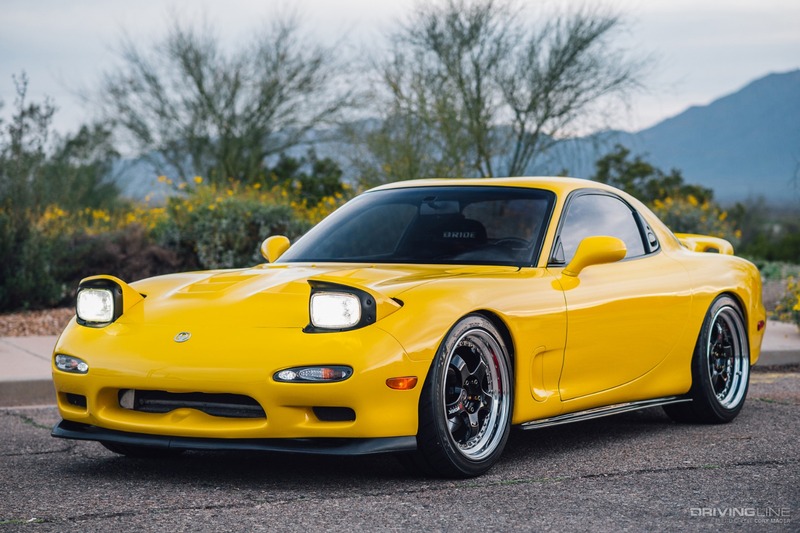 This would be the last generation RX-7 to make it to American shores before Mazda replaced it with the RX-8. 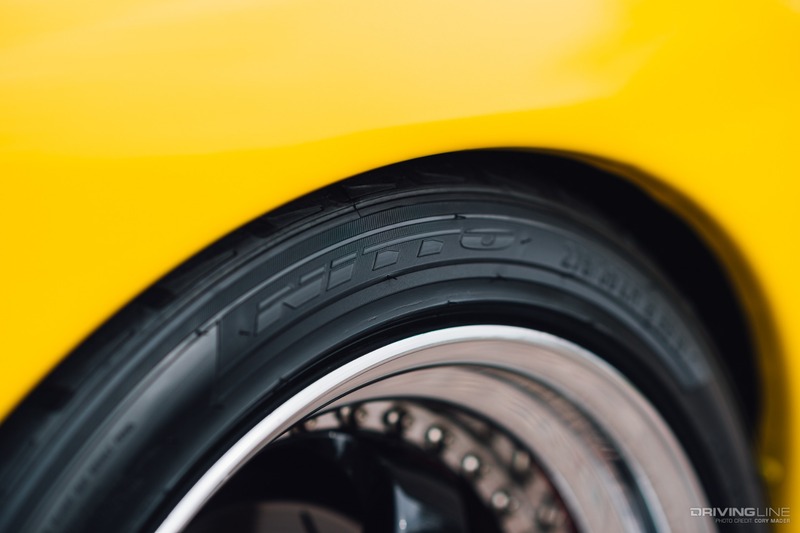 During its time on showroom floors, only a touch less than 14,000 were sold nationwide, and of those, only 350 were R1-spec Competition Yellow Mica. 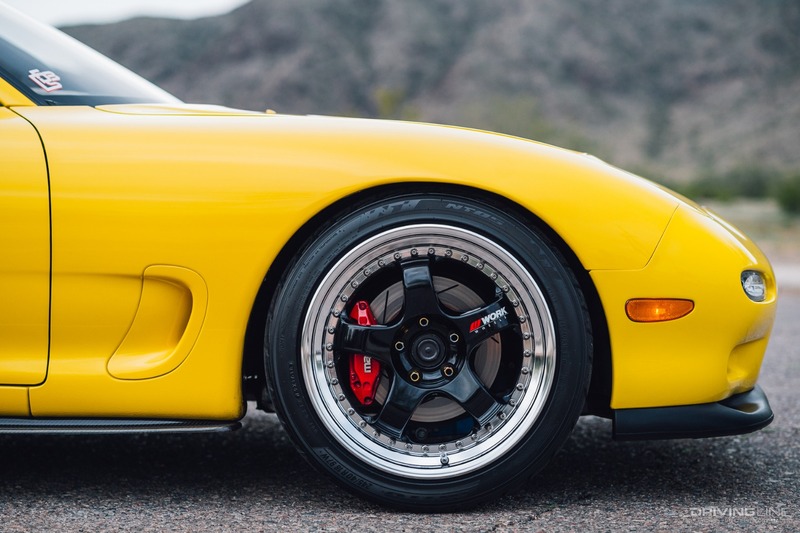 Fast forward to 2000, seven years after the car rolled off the dealer lot, and an Ebay listing for an R1 in Hawaii caught the eye of a younger Tim Eull. 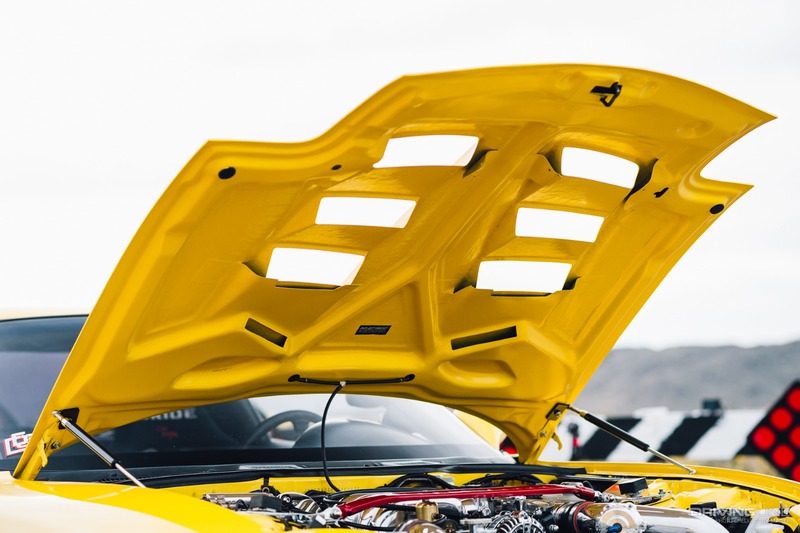 Without even being able to see the car in person, he bought it and had it shipped to Arizona by way of the port of Long Beach. After a little over a month in transit, the car was finally delivered and Tim joined the rotary brotherhood. 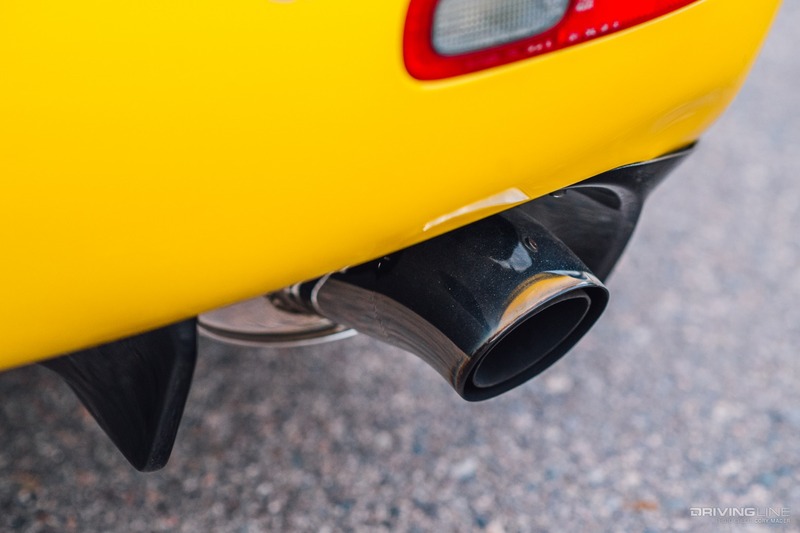 In the 18 years since, the car has been maintained and modified, but never irreversibly. Having resisted the temptation to go with a widebody multiple times, the exterior still has more than a few modifications worth mentioning. 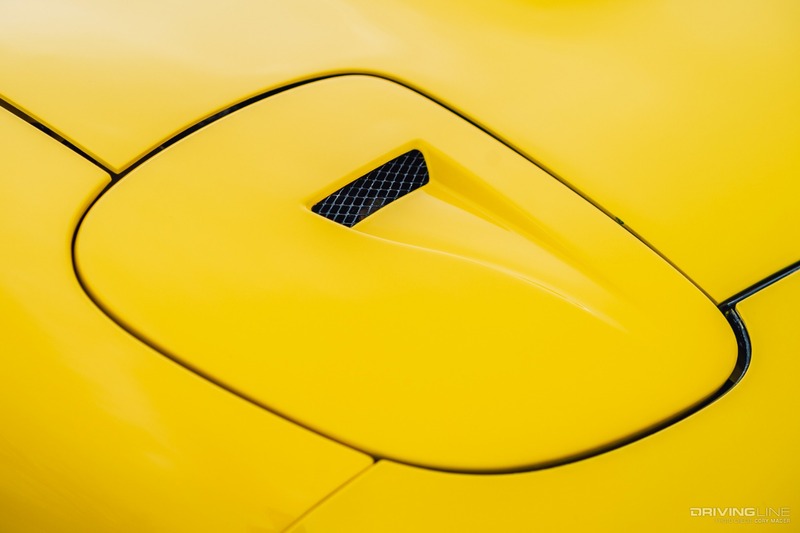 Up front, the RE Amemiya carbon fiber hood has been paint-matched to the body, its large vents showing off the ruby red strut bar we’ll get to in a second. 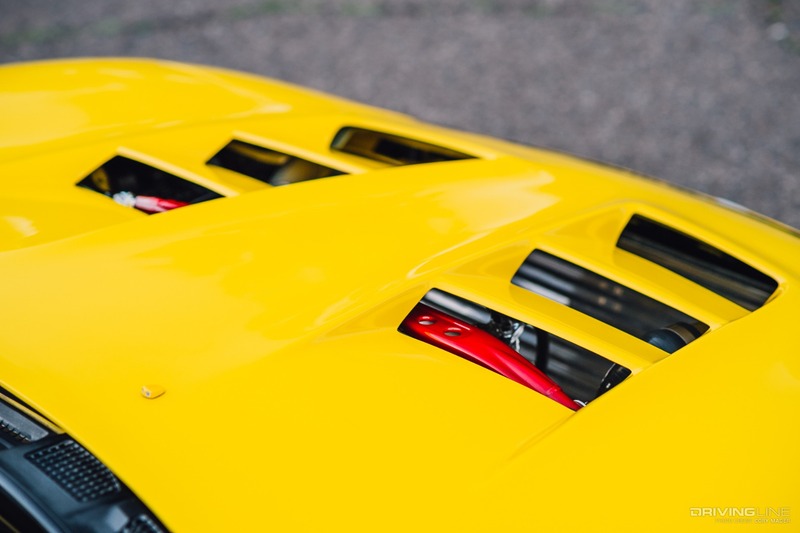 Around the side are FEED door handles and Shine Auto side skirts, both made of carbon fiber, of course. 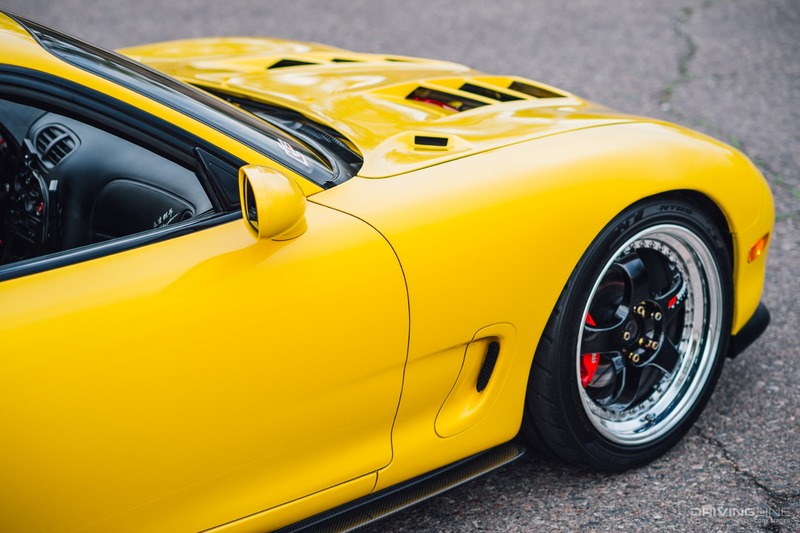 In the rear, a tasteful Shine Auto street-style diffuser adds just a touch of angularity to the otherwise round haunches. 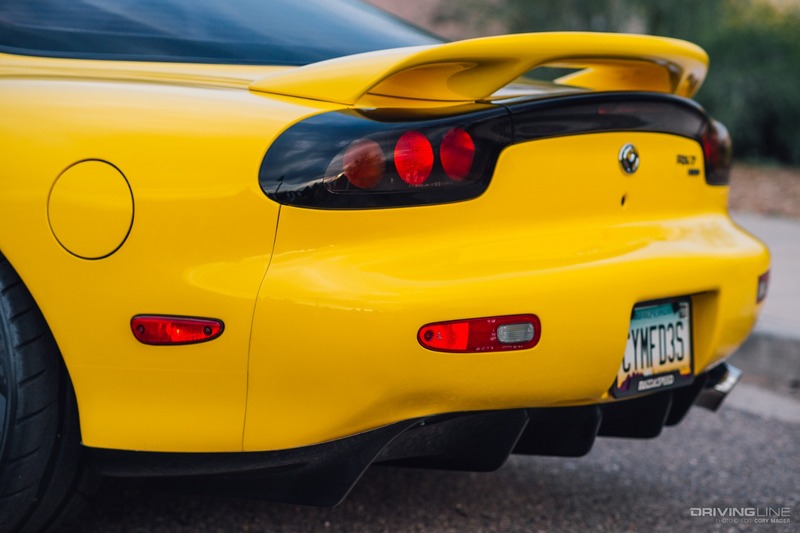 Nestled on the right side of said diffuser is an RE Amemiya Gravity Muffler pumping out that signature rotary sound, and right above are a set of 1999 JDM taillights from an RX-7 the U.S. never got to have. 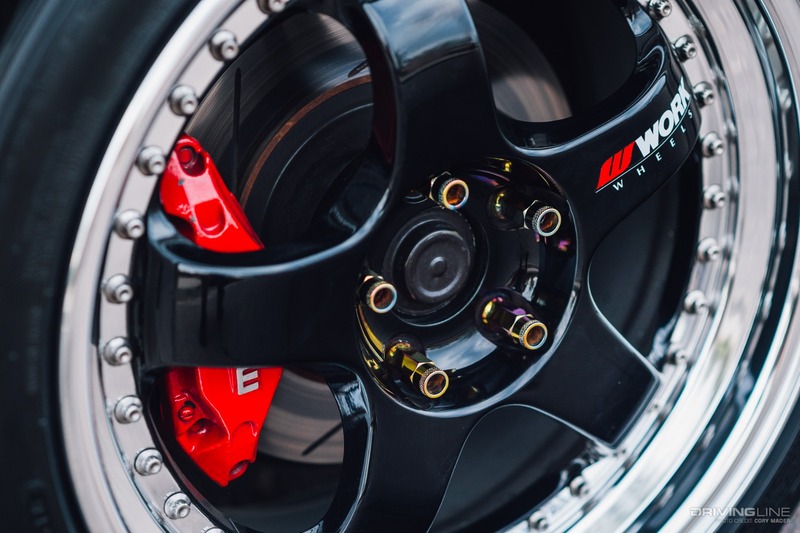 Before heading back up to the engine bay, the wheel and tire package requires a second look. 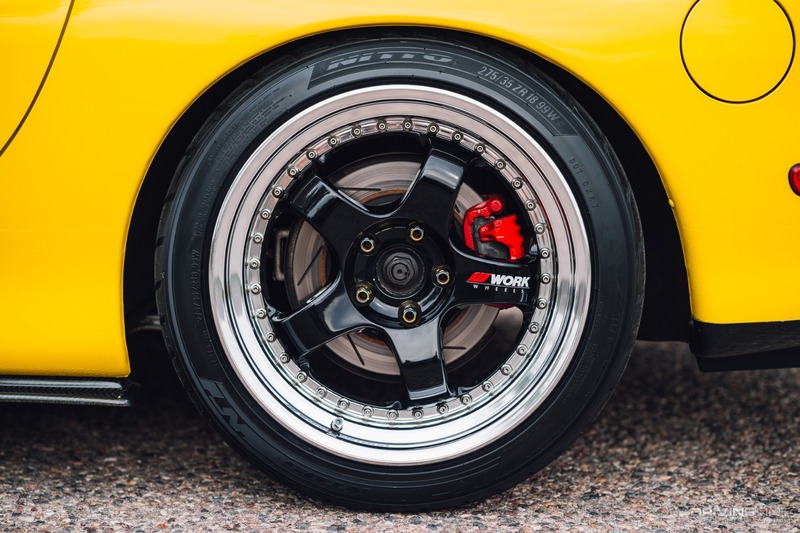 After lowering the car two inches all around on Tein Flex coilovers, a set of Work Meister S3 wheels were fitted with meaty Nitto NT05s, 18x10 inch wheels and 275/35R18 tires in rear, with 18x9 inch rims and 245/40R18 NT05s up front. 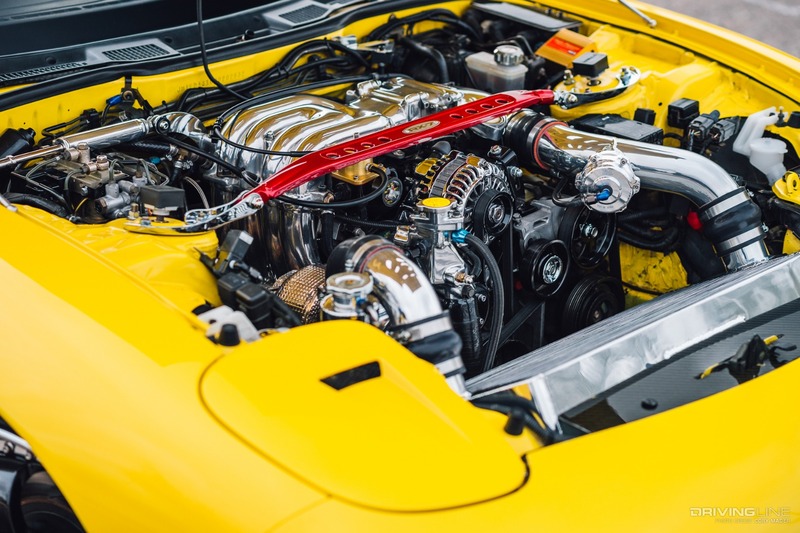 The result is a perfect middle ground between show and go, an athletic canyon carving setup that shines up well for taking home car show trophies. 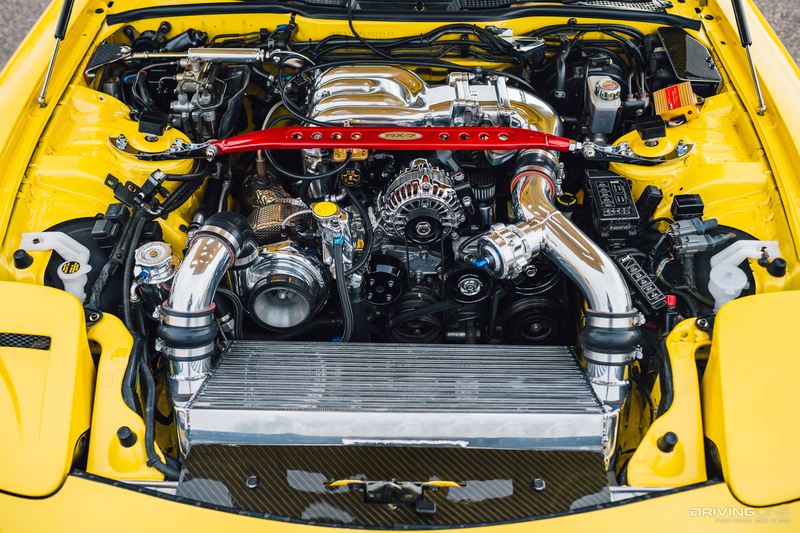 Under the RE Amemiya hood is a testament to Tim’s love for this RX-7. The bay has been noticeably cleaned of the plastic air boxes and piping found in the stock model, but that's not all. 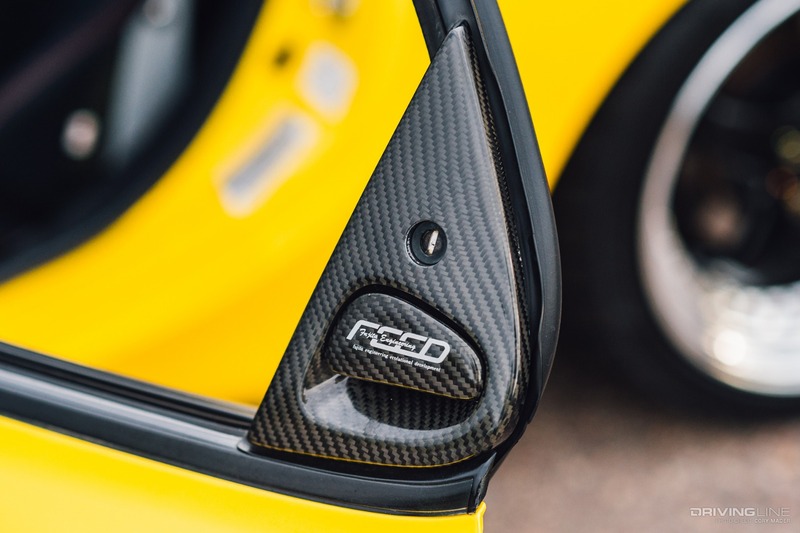 The previously mentioned red strut bar stands out immediately, a holdover from the factory equipment found on the R1, but the ruby powder coating was a custom touch. 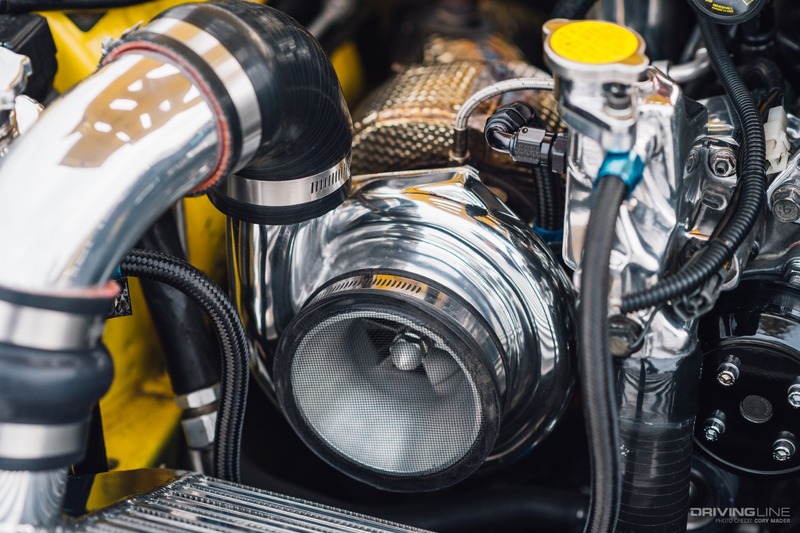 In place of the plastics is a one-off V-mounted intercooler Tim designed himself from a Garrett 3.75-inch intercooler core. 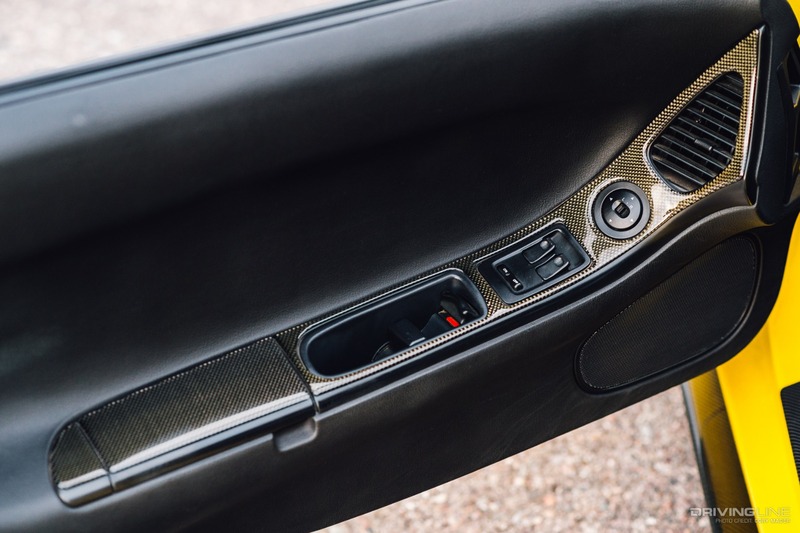 The result is an impressively clean and effective unit that still allows for the stock air conditioning system to cool the cabin—an absolute must in Arizona. 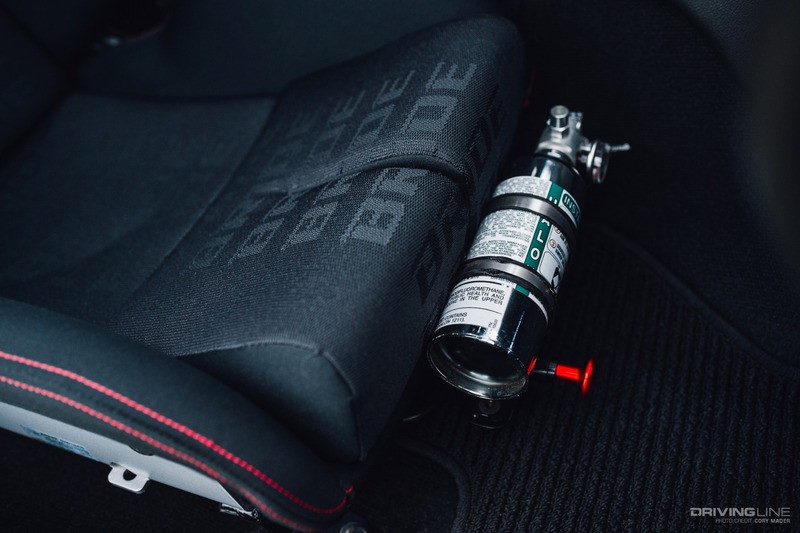 Directly behind sits a 13B-REW powerplant, putting out around 460whp on high boost provided by a single Blowzilla TD61 turbo in place of the factory twin-turbo setup. 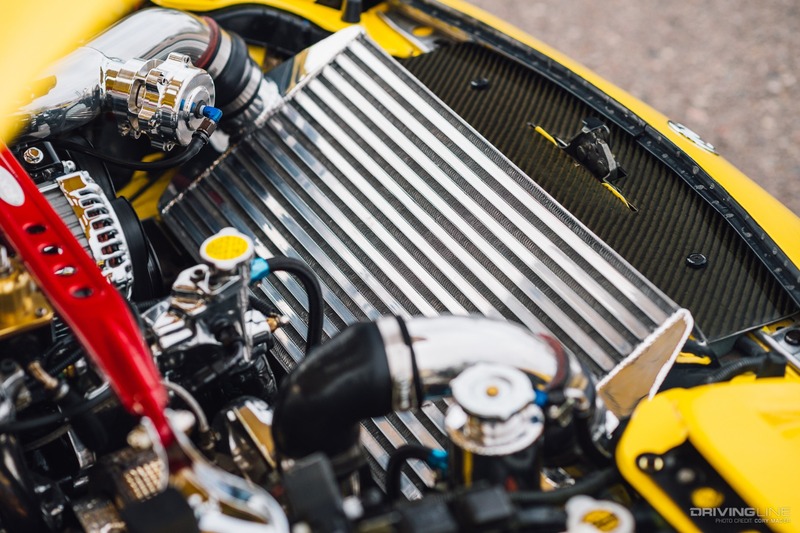 Not pictured is the remote water injection pump and custom two-gallon tank keeping the notoriously hot rotary in check, another piece built by Tim himself. 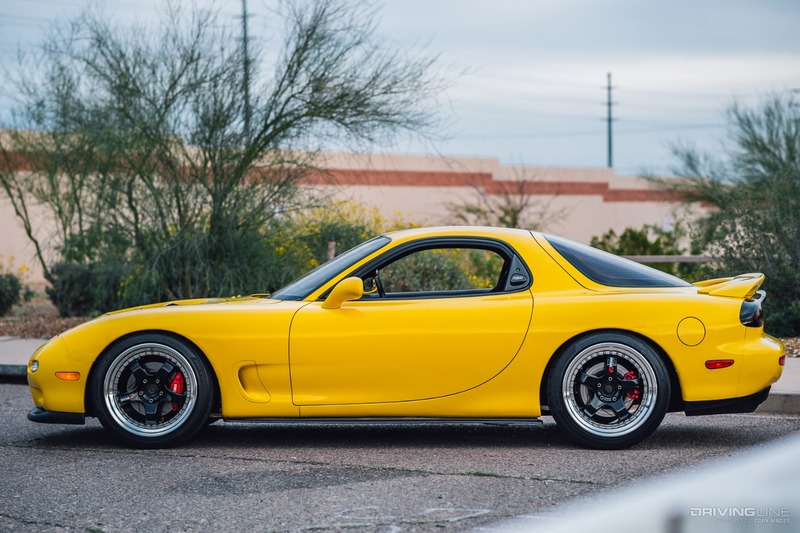 We could spend an entire day discussing the engine work Tim and Glen Weaver of Arizona Rotary Rockets have put into this example of an RX-7, but we’ll leave the rest to the extensive spec sheet found below this article. For now, we'll turn to the interior. 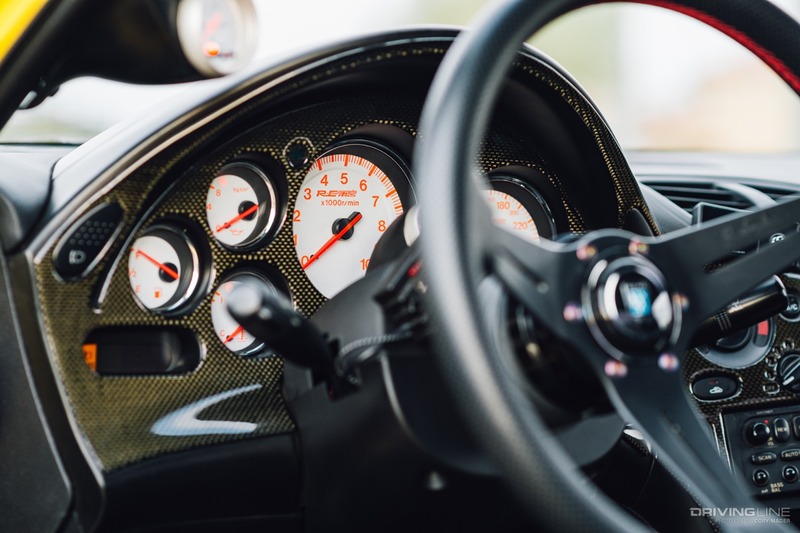 Starting with the obvious, there’s more carbon fiber to be found. 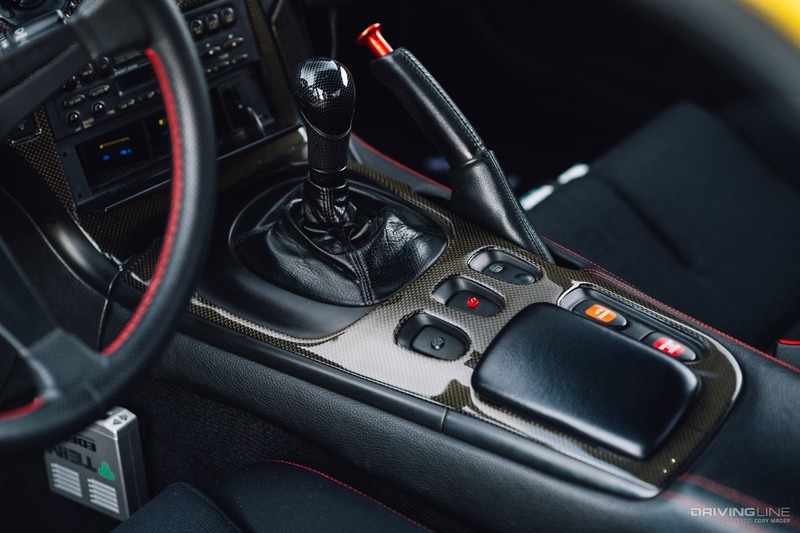 Torasport yellow twill carbon fiber envelops the white RE Amemiya cluster and continues down the center console, while an RE Amemiya column gauge pod completes the functional cockpit. 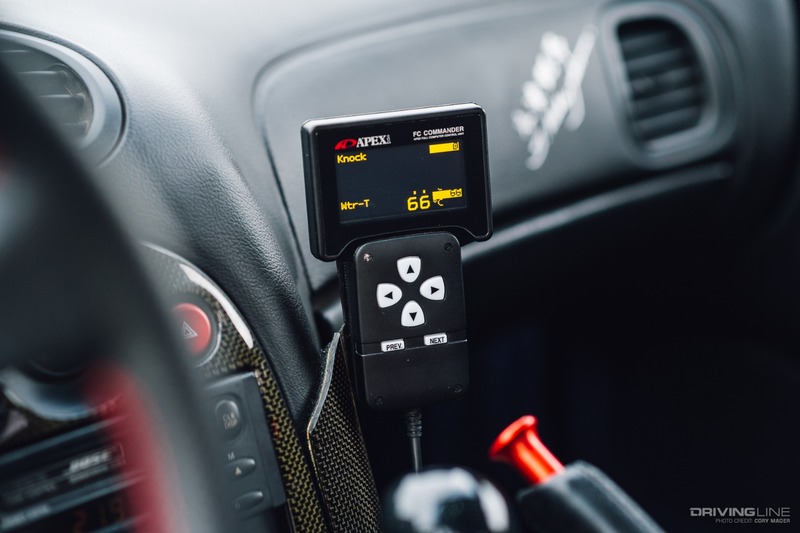 On the passenger dashboard resides RX-7 FD3S project manager Takaharu Kobayakawa’s signature, along with the four FD3S design goals: direction, spirited, alluring and excitement. 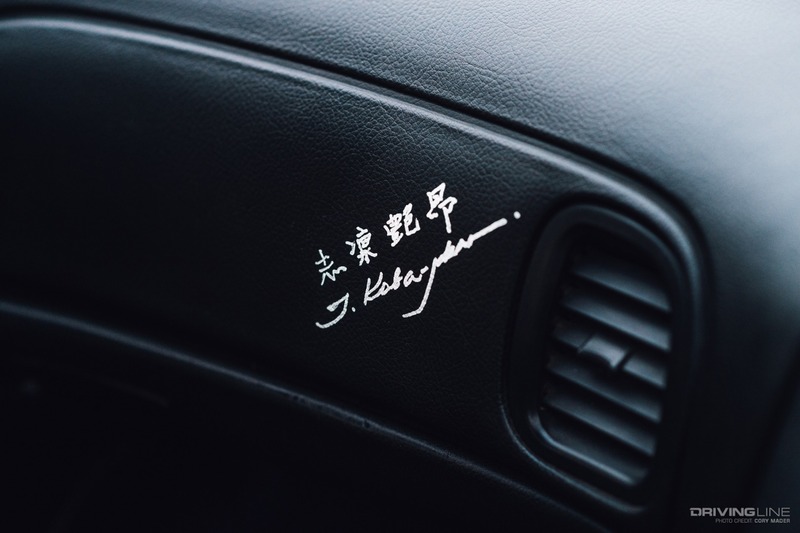 This is the JDM equivalent of Carroll Shelby signing a Cobra, and as such, certainly deserved its own photo. 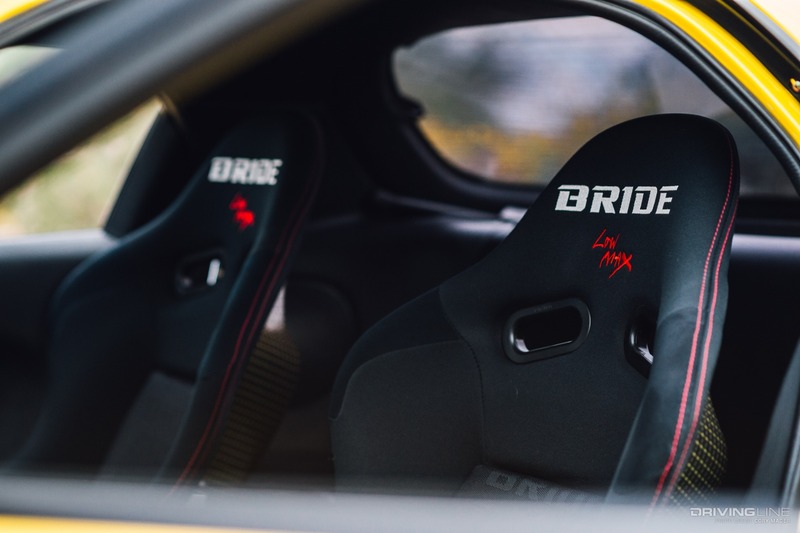 A pair of reclining Bride seats, backed in yellow twill carbon fiber, of course, help on long hauls, of which this car is a veteran. 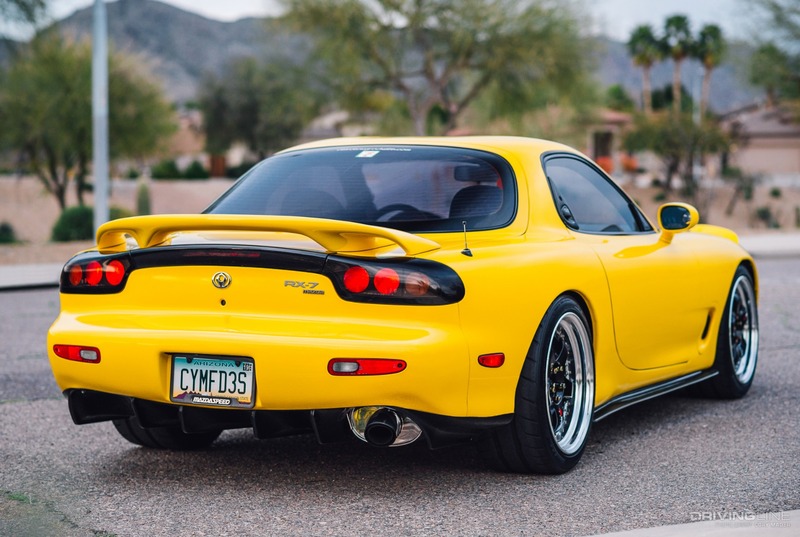 For 17 of the past 19 years this car has made the 700 mile round-trip from Phoenix to Fontana and back for SevenStock, SoCal RX Club’s national rotary mecca. 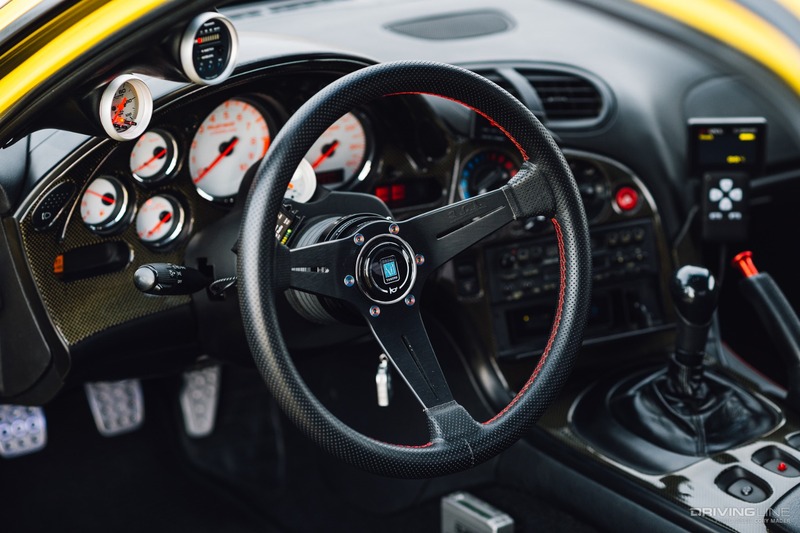 The only two years it didn’t make the desert crossing along Interstate 10 was while the engine was being rebuilt one year, and another year when Tim procured a vendor space and couldn’t haul his wares in the limited cabin space of the FD. 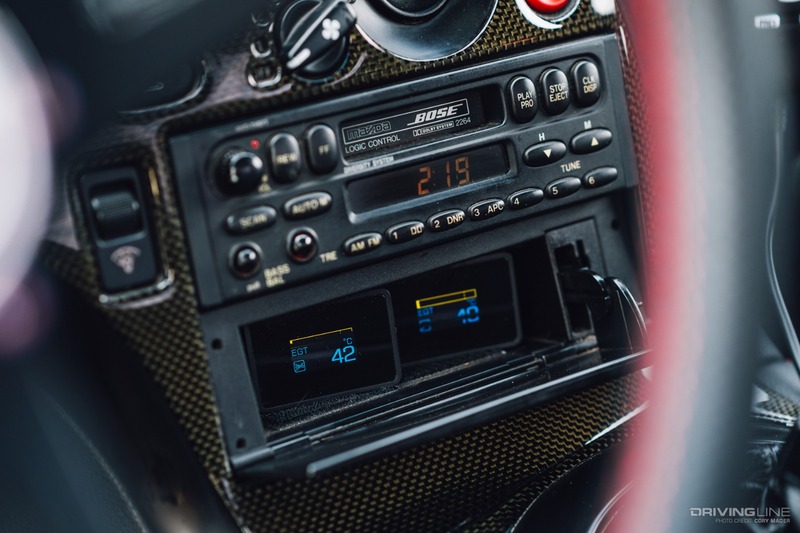 It’s easy see why the RX-7 holds such a special place in the automotive zeitgeist: the “magic doritos” of the rotary engine, the timeless exterior design, the cultural references of Initial D and Fast and Furious. 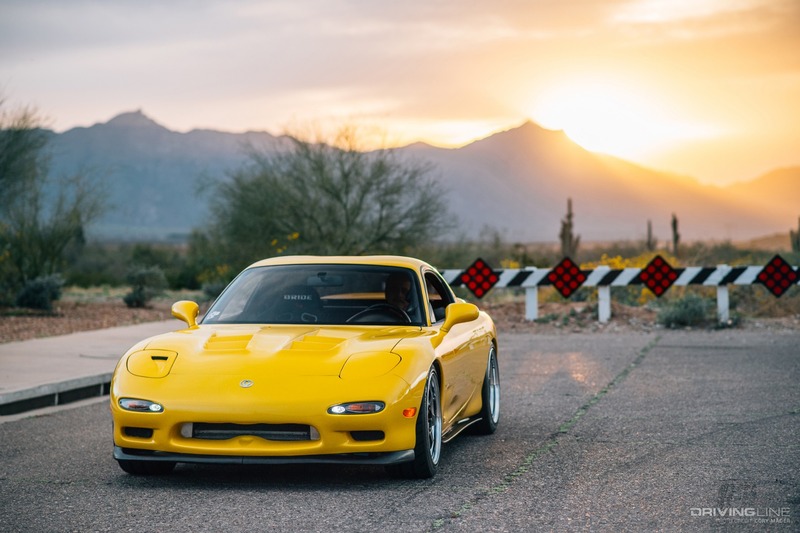 So while we can’t say the same for the wildflowers of Arizona, it’s a good thing this Mazda will be available to appreciate for seasons to come. 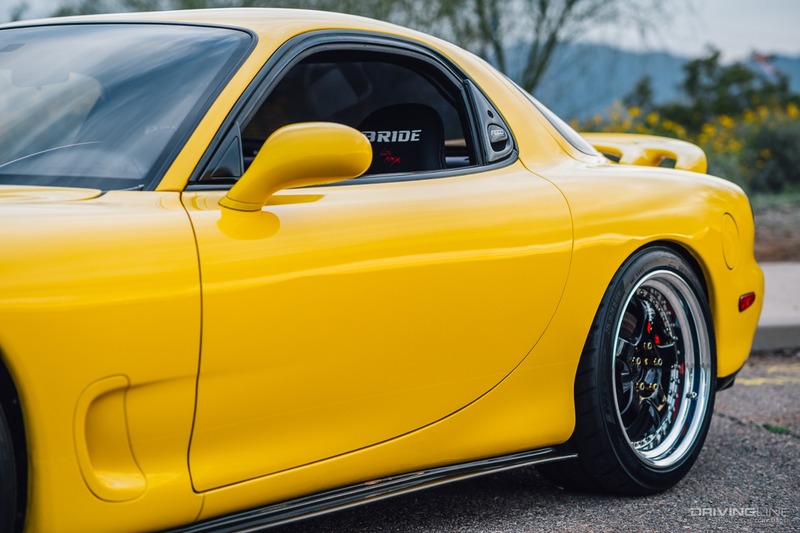 Check out even more detail on this prime example of an RX-7 in the gallery below! 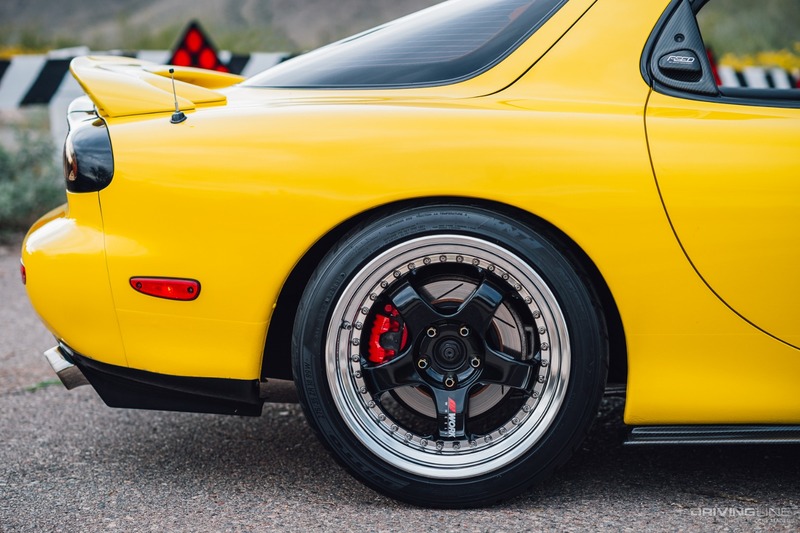 Want to know what it's like to drive a bone-stock RX-7 R1 today? We drove one to find out!